Oven Tacos: delicious beef and bean tacos baked in the oven! So popular they have a day-of-the-week designation (Taco Tuesday, anyone? ), tacos are always a family favorite and crowd pleaser. 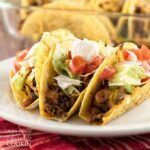 These beef and bean oven tacos start with a simple yet flavorful ground beef and pinto bean filling that’s piled into crunchy taco shells. Pop them in the oven and then top the hot and crunchy tacos with all of your favorite toppings. Ah, taco night. 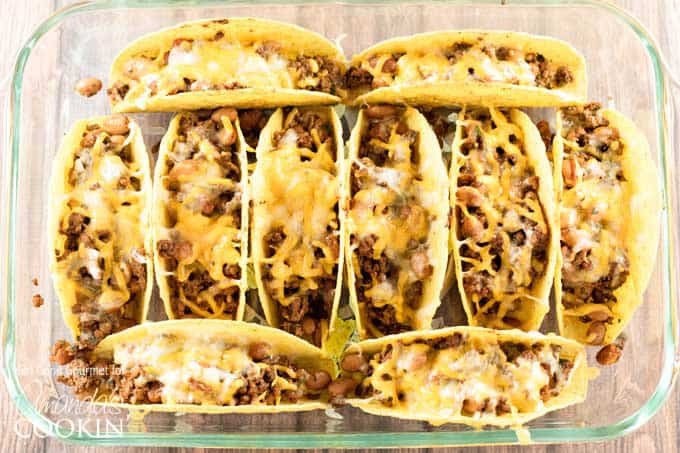 Growing up it was always a favorite dinner and even now, many more years later than I like to admit, it just doesn’t seem right to not rotate tacos through the weekly meal plan. There’s a nostalgia and familiarity in cooking up the filling, piling it into taco shells, and topping it with all the classic toppings. Cheese, lettuce, tomatoes and sour cream are classic taco must-haves. While flour tortillas are convenient and delicious sometimes it’s fun to break out a box of crunchy taco shells and fill them up with a savory ground beef and bean filling. But, before you take a big bite, pop those filled tacos into the oven first. Warming those taco shells does something magical – instead of shattering into pieces when you take that first bite a warmed-through shell maintains most of it’s crunchy goodness, without completely falling apart on you. 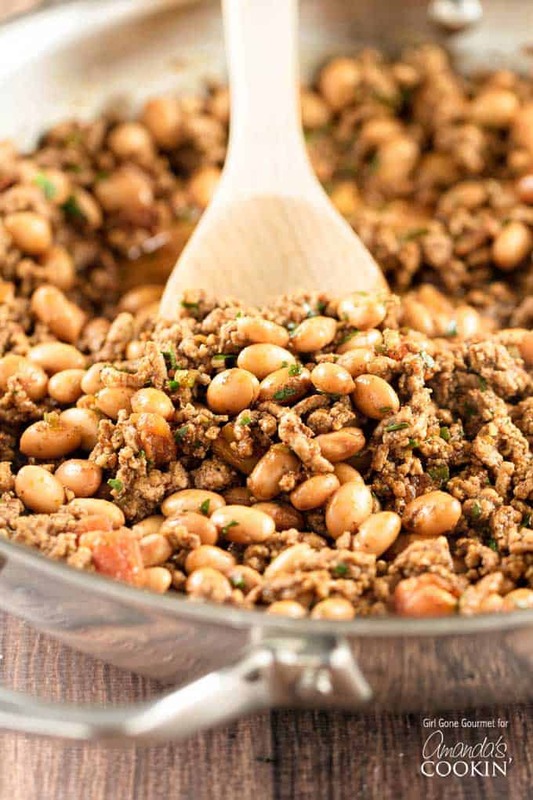 Sometimes simple is better and, in this case, some ground beef, pinto beans, jalapeno, garlic and chili powder go a long way to create a savory delicious filling. It takes all of 10 minutes on the stove top and then just pile it into the taco shells. Done and done. So break out that baking dish and the crunchy taco shells! Don’t forget: Taco Tuesday rolls around once every week and these beef and bean oven baked tacos need to be added to the must-make list. I use ground beef a lot. You can substitute ground turkey or chicken for many of these ground beef recipes, let me know how they turn out! If you are looking for a cheesy dish the family will love, try this bacon cheeseburger pasta! We love Mexican flavors in this house, so this Taco Casserole is right up our alley. Using the slow cooker is so convenient, and these slow cooker meatball subs are the perfect take along for football practice! 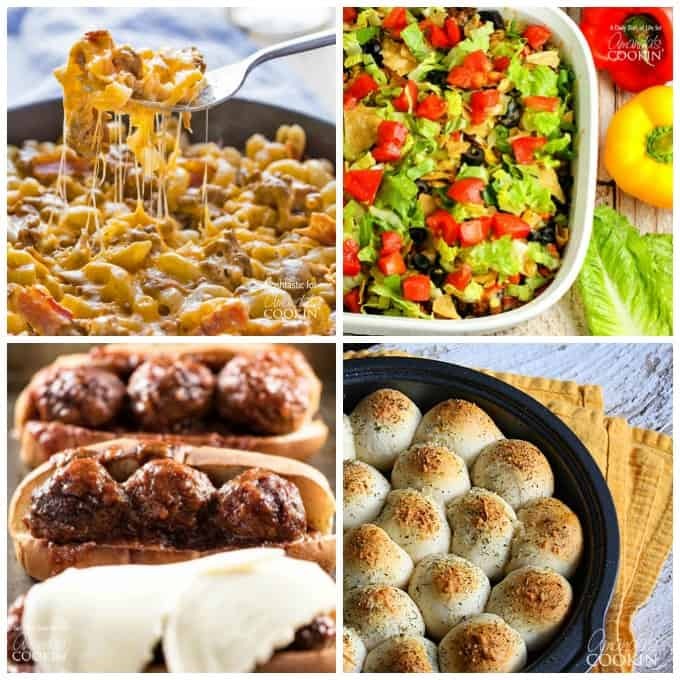 And speaking of meatballs, these meatball stuffed biscuits are awesome for parties or after school – think football! Just like these oven tacos, our oven chili dog recipe is a simple weeknight meal that everyone will love! Add these to your Taco Tuesday must-make list because these beef and bean oven tacos are destined to be a family favorite. Heat the olive oil in a large pan over medium heat. Add the garlic and Jalapeno and let them cook for a minute or two. Add the ground beef and let it brown breaking it up with a spatula or wooden spoon. Once the beef is browned add the chili powder, salt, tomatoes, and beans. Stir it all together and let it cook another five minutes. Place the taco shells in a 9 x 13 baking dish. Fill each shell about half-way with the filling. Top each taco with a sprinkling of cheese. Bake the tacos at 375 degrees for 20 minutes or until hot and the cheese it melted. Top the tacos with lettuce, tomatoes, and sour cream and serve.